On June 26, A----a was told in the morning, "You are going to have visitors today." She was very excited, insisted that the workers wash her hair, and she put on a princess dress. As soon as Kristina and I walked into the room, she stood up and said, "This is my mama and my papa. I'm going home now. Goodbye." It wasn't that simple, but we did get to enjoy 10 days with her, and now we have to return two more times. Kristina and I have thought about adoption since we were teenagers...we married when we were 20 years old and shortly thereafter pursued adoption from foster care. We have three biological children, 2 adopted children, and are now adopting again! We are adopting from a nation near Russia. Our future daughter is almost five years old, and her name is A-----a. She's a cutie! She's been living in an orphanage most of her life and we can't wait to bring her home.Our girls are excited about having a new sister, and we're getting the room ready.We will need to travel to Eastern Europe three times, so the cost of the adoption is almost $40,000. We have already covered some of the cost, but we have a way to go. We would very much appreciate your help in bringing A----a home. Even though I get a small break in fees for working at an adoption agency, the cost is still great.Thanks for your encouragement, your prayers, and thanks to those who are also contributing. We look forward to introducing you to our new daughter.We expect to travel in mid-August for court, and expenses will be about $2000. As our gift to anyone who contributes, we'll send you a copy of Dan's new book Who's Using You?. Dan and Natasha are flying to Kyrgyzstan on Sept 15 and will be bringing Aidana home on Sept 23! Please pray for them and say hi to our new daughter when she comes back this month! The cost of this trip is about $2000...we are so grateful to all who have contributed. Kristina is flying to Bishkek on Friday, Aug 14 (by herself) for our court date! After she gets back, we will have to wait about 6 weeks for our final trip. Thanks for asking about Aidana! The cost of this second trip is about $3000. The cost of flights for our first trip to Kyrgyzstan in June will be about $3200. Thanks to those who have already given! We are traveling to Kyrgyzstan very soon! Leaving June 24 and returning July 6. We will be in country for 10 days meeting and bonding with Aidana. Not all of our kids will be able to come with us = (. Happy to have a part! You are doing a wonderful thing! Congratulations! 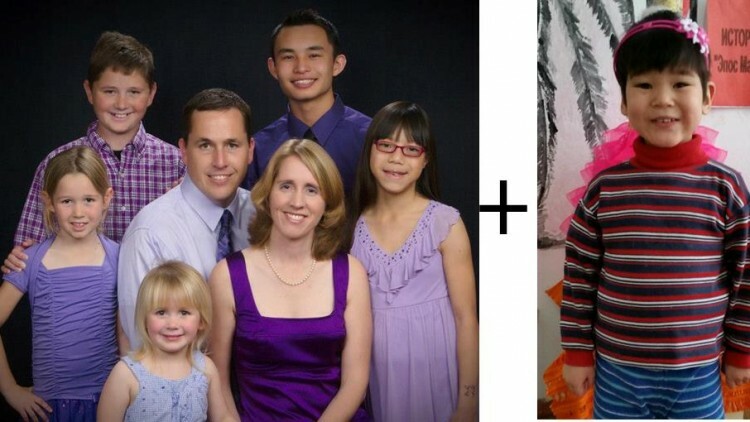 So happy for your family and so blessed to be an advocate for adoption! We are alongside you in this!! Nadia is doing fantastic. We are praying!! Many blessings and safe travel. God is so faithful!! Praying for your family as you head to Kyrgyzstan. Very happy for you and your growing family! Congratulations Daniel and Kristina! I am so happy for your family! What a beautiful little girl that you are bringing into your lives! Sending prayers and positive thoughts that all goes well with the adoption. So awesome to hear of your new daughter-to-be. Adopting Zoey was the best thing we ever did! Wishing you good travels. Keep up the great work of the Lord, Dan and Family! Dan and Elizabeth - I went to Amazon to write a review and found that I could not post it as I do not make purchases on Amazon and that was a requirement. So here I am including the following review and a donation (I hope it works) to assist you with your latest child's challenges. I’ll start by admitting that I am writing a review as that commitment has allowed me to obtain a second copy of this book. The first marked up copy has already been passed on per a request from a person who discussed it with me. And yes, I found this book insightful enough that I wanted to retain a copy for future reference. Just this one person’s opinion, but I do not use the word “reference” lightly. My college degree in Biology subjected me to a lot of “reference” books and Daniel Nehrbass’s book fit in that category quite nicely. I found its format written in a manner that allowed my first read to be a skim through the chapters noting specific areas that moved me to go back and read deeper in an attempt to extract the variety of messages that he was delivering. In that second, and in some cases, third read, I found myself moved at times quite nicely by what was being stated as well as at times finding some of the points, though not applicable or agreeable to me, a starting place for thought and discussion with others if the opportunity presented itself. And so to that end, the book has not only provided value to me but to others that I have now been in discussion about “Using” to which Dan has done a nice job of providing a nice reference. And for those reading this review that have not chosen Christianity as their faith, I would encourage you to not let that fact sway you against a read through this book. I recently was with family and friends in a small town where my sister spent 3 years taking care of my mother 24/7. Those friends, some self-proclaimed atheists and agnostics, were also experiencing the same long term care issues with a loved one. My recollection of points read in the book that were applicable to the conversations allowed me to sit, listen and better understand what these care givers from all walks of life were going through. Just one person’s opinion. And yes, I am in the process of marking up my second copy as this is review is being written.